Micron Precision is situated in Countesthorpe, Leicestershire and was established in 1990, primarily to repair single blade reamers and fine boring tools supplying them back to the customer in their original condition. Micron Precision has slowly developed into the company it is today with quality machine tools and systems supplying precision special cutting tools to the uk manufacturing industry. In 2002 the purchase of a six axis wire erosion machine allowed production of PCD combination boring, reaming and complex form tools. 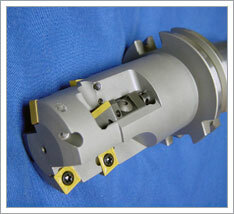 The main area of business for Micron Precision is in the finishing of tight tolerance bores. In 2007 the development of the single blade reamer system Micro-Ream added another product to our catalogue of complex cutting tools. Micron Precision can offer a full bespoke package, from the design & manufacture of special tools to technical engineering solutions for machining problems encountered throughout the aerospace, automotive industries, sub-contract and general engineering.